Acne scarring can affect a person with untreated acne in as little as 9-12 months. Up until now that scarring has been, essentially, permanent. VIP Aesthetics is proud to announce that we are now using the state of the art elōs technology by Syneron to treat scars. Amazingly, elōs can treat scars not just from acne, but any depression scarring. That means the dimples and craters often left behind by chicken pox and other disease, acne and trauma which were once thought to be permanent can now be treated safely and effectively! 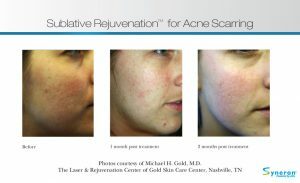 Acne Scarring removal technology combines bi-polar radio frequency and laser light energy and allows for the elastin fibers that are depressing the skin to be broken and relaxed so that they release the pull and skin can begin to smoothen again. This treatment also encourages the production of collagen, which will lift the skin and begin to fill in the depression. 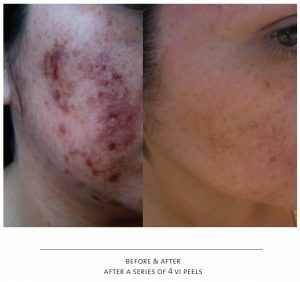 Whether your scarring is new, or you have been suffering with a lifetime of scarred skin, VIP Aesthetics has treatment options for you. While treatment for acne scarring is one of the most aggressive laser treatments we offer, it is still safe, effective and nearly pain-free. Repeated treatments will be required, but the number will depend on the severity of your scarring. At VIP Aesthetics, we understand that the investment you make into laser therapy for scarring is important to you. Our expert staff is committed to giving you the results you desire and to address any questions or concerns.